Review written by Cormac Richards. Written 111 years ago, The Wind in the Willows has firmly become a classic of English literature and has been adapted many times and in many ways. Kenneth Grahame’s gentle story of animals has, at the heart of it, themes of friendship, good over bad and respect. And now, IN THE WILLOWS uses the same story, themes and characters and gives it a whole new setting. So, The Willows is a school run by Mr Badger; Toad, Ratty and Mole are pupils; The River Bank is the local club and the Wildwood is a broken housing estate Toad is a rapper and the animals dance hip-hop style. Somehow and much against my initial thoughts – it works – it works a treat. Metta Theatre has set itself a huge target – it says it “exists to change the world” and although this is very admirable, my first experience of their work is certainly making an impact. The Company embrace diversity in all its forms and here they have found the perfect vehicle to display their ethos. The story of Toad transferred to the classroom is perfect. 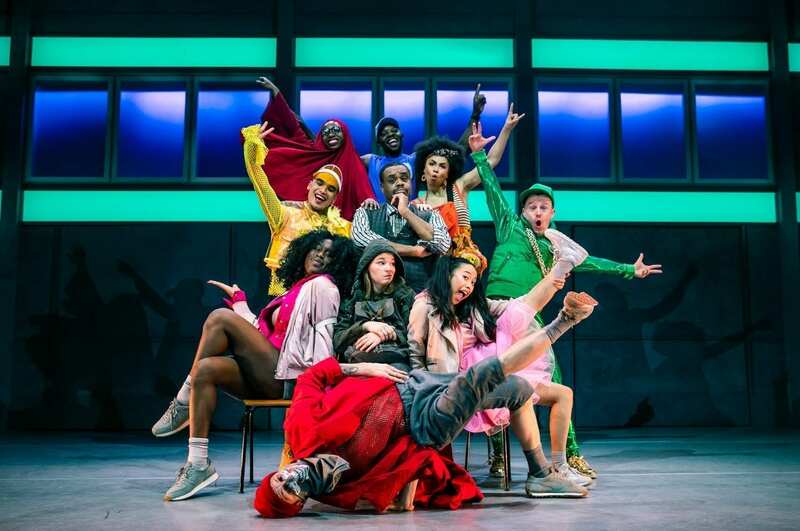 Here Toad is a naughty, chavvy boy – all gold chains and green tracksuit, Mole is a new pupil – nervous and friendless; Rattie, a confident, university-bound girl with a sense of right and wrong. They are augmented by 3 pink rabbits, a be-spectacled Owl, a very tall Otter and a camp, long-legged Duck decked out in fabulous yellow! We still have the band of Weasels who are a street gang lead by their Chief in long red coat and beanie. All through this re-telling are little reminders of the original story – Toad escapes from prison inside an old washing machine – wonderfully inventive! The music score is exhilarating; a marriage of hip-hop and musical theatre styles which shouldn’t work, but does, wonderfully. The attendant dancing is excellent and exciting whether it be through breaking, voguing or tutting, these are a talented group and they are right on the money. Choreographer Rhimes Lecointe has hit the beats perfectly. The script and lyrics are cleverly crafted and in rhyme and often extremely hilarious. A side story about Toad’s pet goldfish, Alan, is a comic gem. There are even quotes from the original novel woven into the updated words. It’s a splendid re-telling. The sets, by William Reynolds, are extremely well realised and move on and off stage without fuss and with the inventive and cue-perfect lighting and exemplary sound, the production values could not be bettered. Imagination is also brought to bear on the costumes too which must have been great fun for Ryan Dawson Laight to design; they work perfectly. The cast are universally strong. Harry Jardine is a cheeky and very funny Toad – and a great rapper to boot. Zara MacIntosh a really strong Rattie with an excellent voice and dance moves. Victoria Boyce sings beautifully as the nervous and friendless Mole – an invented backstory about having a dead twin brother is cleverly interwoven. Chief Weasel is a breakdancing and menacing character as brought to life by Matt Knight and he too is pitch perfect. Not a major character in the original, Otter is the good guys best dancer and is played here by Chris Fonseca, a profoundly deaf actor. The whole show is signed, either by an actor at the side of the stage or by Otter – and others. It works so well and is integrated with skill. Seann Miley Moore made a big splash on The X Factor a few years ago and here he struts his stuff in spectacular fashion – a joy! With his fantastic singing and speaking voice, the highly-respected Clive Rowe brings gravitas to the proceedings as wise Mr Badger – what a privilege to see this great performer at work. His song to comfort a distressed Mole is so very moving. Poppy Burton-Morgan has written a wonderfully effective and affectionate version of the original and directed with precision and flair. Pippa Cleary and Keiran Merrick’s score is inventive, diverse and fun – spot on. In The Willows is theatre at its best. It provides the widest of possible audiences with high entertainment; joy, emotion and thrills. You cannot ask for more. Drop everything and go and see it! In The Willows is at Oxford Playhouse 9th and 10th April!